When it comes down to it New Zealand is all about islands. The whole place itself is an island, but the main islands are themselves the mainland to a number of smaller islands. As I have explained before these islands are the best place for a lot of the birding here because they are more easily protected from introduced mammals which wreck such havoc on the wildlife here. It was to one such island that I went to this week, Matiu /Somes Island in Wellington Harbour. The double-barrel name comes from the Maori and Pakeha names for the island, like many places where one or the other hasn’t won out the island is referred to in all instances as both. Matiu was the daughter (or niece) of the semi-legendary Maori navigator Kupe, who discovered Wellington Harbour. Somes, less interestingly, was a rich backer of the New Zealand Company called Joseph Somes (who never went near the place). The island was first a Maori fortress to be retreated to from the mainland, then a camp for internees during the war and a quarantine station for people and livestock. Since 1984 it has been planted with native bush and pests were controlled, and is now used as a wildlife reserve. 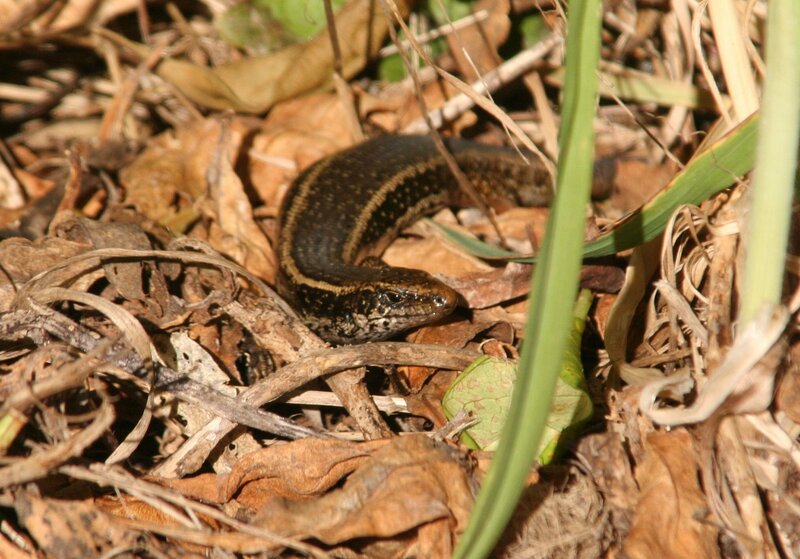 In 2009 the island as returned to the local iwi (tribe), but it is still managed by the Department of Conservation. The purpose of the trip wasn’t specifically to look for birds, it was my flatmate’s birthday, and her family had booked two of the houses on the island so that we could enjoy a weekend break away to celebrate. The island is serviced by ferries that leave from the city, and we set out across a sunny flat harbour in a city that bore little resemblance to the winter we experienced just two weeks back! 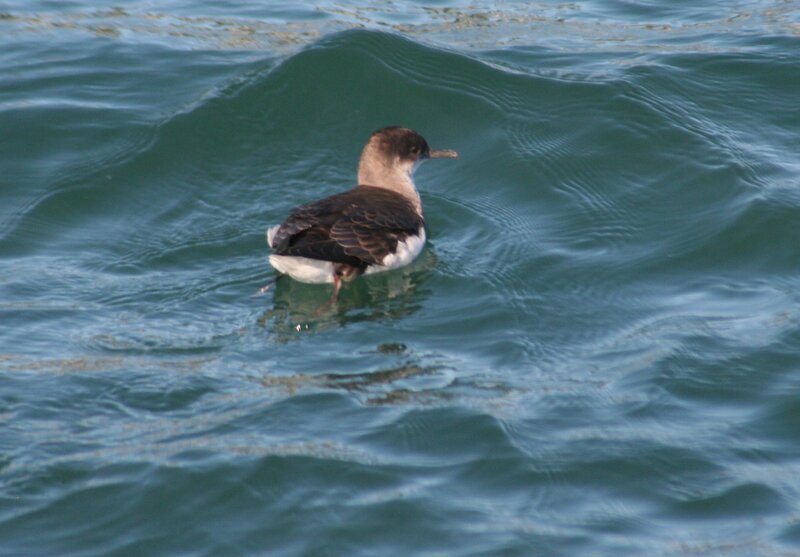 Wellington Harbour is great for coastal seabirds, and we so dozens of Fluttering Shearwaters on the trip. Or, at least, I did. I don’t think anyone else noticed. They are a common enough coastal bird that can been seen from shore on some days paddling around the marina, but a nice bird none-the-less. The island itself is very pleasant. Nice wide paths around the island afford great views of the harbour and the city beyond, and you can’t walk a few feet without hearing the rustle of skinks dashing for cover, even in winter. 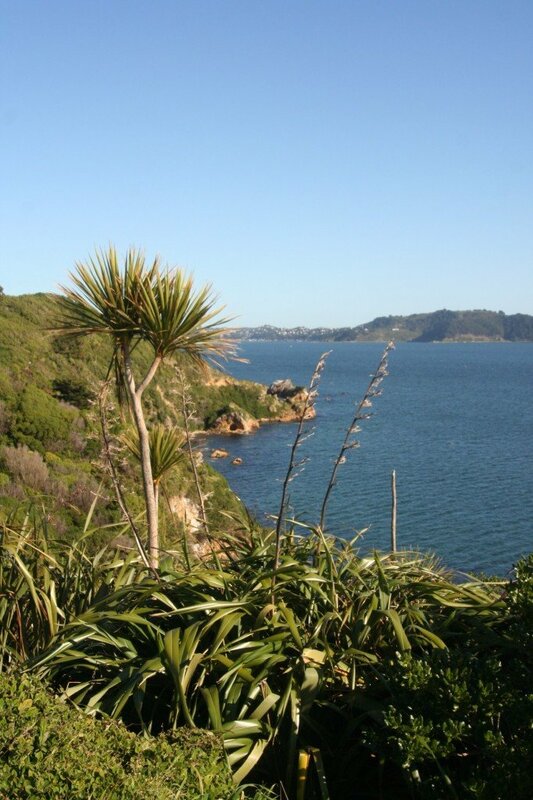 The west coast of Matiu / Somes with New Zealand flax (Phornium) and a cabbage tree (Cordyline australis). Across the water is the Miramar Peninsula, where the Hobbit is presently being filmed. The island is smaller than Kapiti and has less landbirds, although there is a small population of North Island Robins. There is also a rather larger population of Red-crowned Parakeets, and it is impossible to go far without seeing them flying manically to and fro or hearing their churring call. They are rather shier than the Kaka, and can be hard to approach (and photograph!). 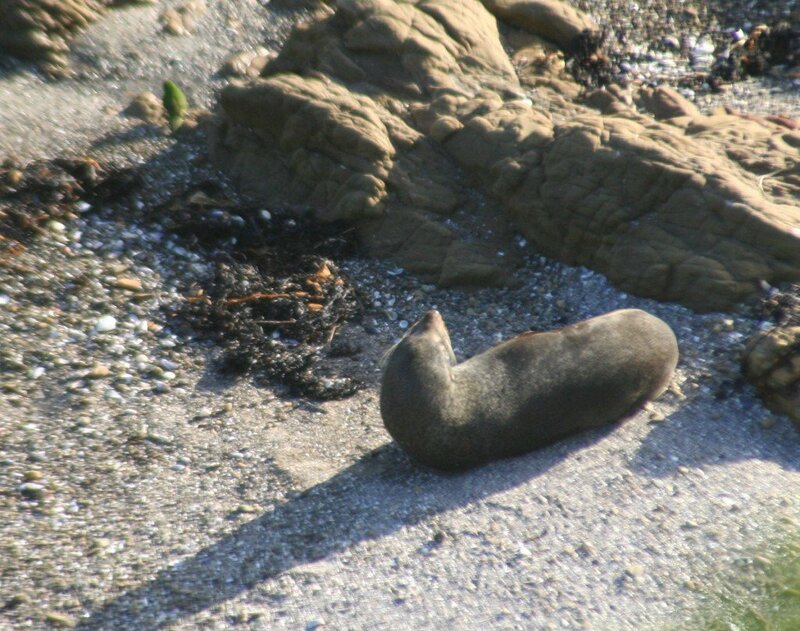 The highlight of the weekend was seeing a pair foraging on a beach, searching the sand and tide strands for various morsels like a turnstone, and approaching the dozing New Zealand Fur Seal without the slightest sign of fear. At the same location it was possible to watch Spotted Shags collecting nesting material and try and get airborne. The island represents one of only three places in North Island that has this New Zealand endemic. They are to my mind the most attractive member of the cormorant family, unfortunately I don’t have a photo of sufficiently good quality to show here. I’ll work on that. Red-crowned Parakeet foraging near a New Zealand Fur Seal. At night we had planned to go out looking for Blue Penguins, around 600 of which make the island their breeding home. This required dark, and since the whole point of the weekend was celebratory there had been a certain amount of alcohol imbibed as the sun had set across the harbour. I was nominated bird expert (I’m sure this happens a lot to readers in similar situations) and as anyone who has gone night wildlife watching before knows the difficulty of finding anything increases with every person you add to the group (and every glass of wine that person has consumed). So while we heard plenty of penguins, we never actually found any. Oh well, better luck next time! One of the most charming traits of NZ is the combination of tropical and subantarctic elements, such as parakeets foraging amongst seals. And yeah: two thumbs up for Spotted Shags!! Speaking of sub-Antarctic parrots, guess which parrot is coming to Wellington this month.